Escape the Alamosa Sand Dunes in Jasper, Colorado! See our special rates for the month of June! The Lost Elk Lodge is ideally situated for deer, elk and other big game hunting (GMU 80/81). Contact us for a quote! The Lost Elk Lodge is a unique wilderness experience located in the heart of historic Jasper, Colorado. The cabin is built on the location of the old Cherokee Trading Post of a bygone era. The property is 1 acre of commercial resort/tourist (CRT) land, with 300 feet of frontage on Forest Service Road 250 and a seasonal creek running next to it. There is year-round access with the road plowed to the driveway of the property making it ideal for 4 seasons of fun. From hiking to snowmobiling, hunting to fishing, wildlife viewing to just kicking back, there's a little something for everyone. While hunting is not allowed in the town of Jasper itself, it's important to note that usually a short walk from any property takes you in to the Rio Grande National Forest where elk, deer, bear, big horn sheep, coyotes, game birds and countless other game are readily available. Likewise, the Platoro Reservoir is a short drive up the road and hosts freshly stocked trout and Kokanee salmon, not to mention all of the secret streams, lakes and ponds known by the Jasper residents! 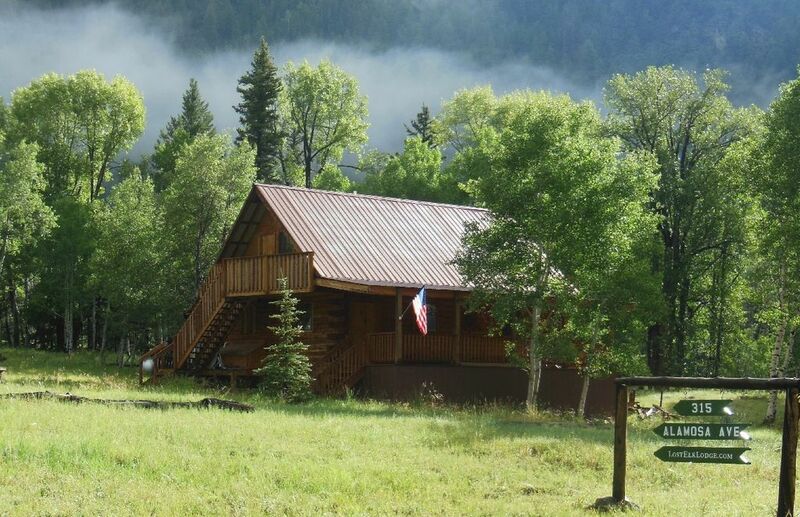 Located in the remote Rocky Mountains, in the South San Juan Range, the Lost Elk Lodge offers an off-grid escape while maintaining the most important of creature comforts. Although there is no commercial power, the cabin is self-sufficient with solar, batteries, propane and a generator. The artesian well produces fresh spring water which is safe, delicious and refreshing to drink. The cabin is approximately 1100 interior square feet plus another 720 square feet of wood decks that extend from every wall of the cabin. There are 2 bedrooms with additional room for cots, 2 bathrooms, and an open-plan living and dining area. The place is fully furnished with everything you would need for a comfortable stay including bedding, towels, and all of the basic dry goods. Satellite internet and WiFi is also available, allowing guests to connect with the outside world whenever they so desire. Outside only. NO smoking inside the Lodge! Off-grid with solar and gas power. Lovely creekside picnic area including sitting logs and a small sand beach for children (or the child in us)! We really enjoyed our stay at the lodge! We were quite content to spend most of the week on the very comfortable, nice front porch. The setting was grand. We were surrounded by tall beautiful mountains. It was a great place to relax and enjoy. Dara answered all our questions and was so very helpful and sweet. A big thanks to all responsible for sharing this special place! About our stay at the Lost Elk Lodge…the drive up the mountain road was beautiful and breathtaking at times. So much in fact that we overshot the cabin about 3 miles because we were so enthralled with the beauty all around us. When we finally made it to our vacation home away from home we were all impressed with the place. Not only is the cabin nestled in a pristine environment, but the inside is beautiful too. They take very good care of this cabin. The kitchen is stocked with just about everything you need. The beds were comfortable, and the linens smelled fresh. Good linens too. I give the bed and linens two thumbs up. We are big coffee drinkers, so my only complaint is that the coffee pot is small. We made lots of little pots and kept it warm on the stove with their provided larger tea pot. We used the outdoor propane grill just about every night which was great. The Wi-Fi worked great except when it rained but that is to be expected. I was able to email and check on things back at the office when I wasn’t having fun vacationing. The week we were there we had some good rain which kept the creek near us running with water. This creek was an excellent playground for my 6-year-old niece. Further up the mountain we visited Platoro and caught some big trout there. If you’re in to fishing I highly recommend going to Platoro. The cabin is also home to some amazing humming birds. You will no doubt encounter them on the porch. At first I was concerned the solar panels would not provide enough power for a family of 5, but I was mistaken. Running the generator was never necessary…even on the rainy days. Our stay was very relaxing. All our needs were always met. If you’re looking for a place to unwind and get away from it all, I highly recommend the Lost Elk Lodge. A comfortable and beautiful place to live off the grid. We loved it! We wanted to spend some time really away from our busy lives. This was the perfect place to accomplish that goal. The scenery (and local deer) filled many hours of porch sitting, the kitchen was well stocked, the bed was comfortable, and the mountains and stream were wonderful. We enjoyed our stay at the cabin! It was a great experience and hopefully we can stay here again!